On our transatlantic cruise on Carnival Breeze, we had the opportunity to do an interview with Carnival’s popular spokesperson and best-known cruise director John Heald. In this segment he talks about what it is like to live on a cruise ship and the upgrades to Carnival’s ships called Funships 2.0. He also mentions a kitchen (galley) tour. John Heald was the cruise director on our cruise on the Breeze. His very popular morning show filmed in the Club O2, which is normally the hangout for teens. Deck chairs filled to watch his show on the big outdoor screen, many people watched on their cabin TV’s, and each day more people showed up live as they discovered where the broadcast came from. One day John graciously stayed after the show so we could film this interview. John mentions both Guy’s Burger Joint and the Blue Iguana Cantina in this interview, as both are part of the Funship 2.0 upgrades. People often wonder if it costs extra to eat there, and will be happy to know that it doesn’t. The Red Frog Pub does have a very small charge for the excellent fresh made-to-order food found there. In this video, John Heald talks about what it is like to live on a cruise ship and Carnival’s 2.0 upgrades. Other blogs from the interview with John Heald include Best Places on Carnival Breeze, Things to Do and Best Kept Secrets, and Left Behind in Port, Gratuities, Rescue at Sea, Quick Fire Questions, American Table. For more detailed information about Funships 2.0, see this blog. 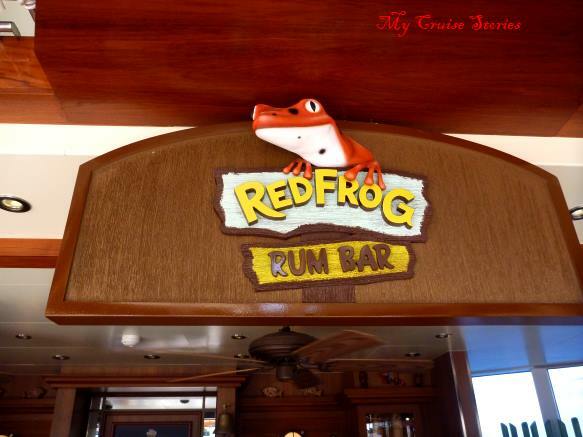 This entry was posted in Breeze, Carnival, Shipboard Life and tagged Carnival, Funships 2.0, interview, John Heald, life on a cruise ship, photos, video. Bookmark the permalink. It is another world, isn’t it? It sure is. I’ve always thought it would be fun to live on a cruise ship, but that’s from a passenger point of view. The crew works very hard. A lot of them make more money than they can in their own countries though. We’ve had waiters that were Romanian doctors working to get money to start a practice because they made more waiting tables on a cruise ship then performing brain surgery at home. Oh my goodness. That says something very sad about the economy in Romania. I heard from a friend who worked on one of the lines that the crew ran heavily to Indonesians and Filipinos. It depends on which cruiseline it is. Some mainly do their hiring in specific countries where others have very international crews. Indonesians and Filipinos do always seem to make up a large base of the crew though regardless. This was Holland America. And Filipinos are overseas contract workers all over the globe – it’s a huge part of the country’s economy, actually. The Filipinos don’t have a lot of career opportunities at home. I thought the cutaways at the end from the spa to the kitchen were funny. Let me get this straight this cruise director lives on the ship all year round? He doesn’t have a home anywhere on land? He does have a home and a wife in England. The amount of time spent onboard varies depending on position and cruise line, but it lasts longer than the time between hitches at home for most crew members.